King mattress is the biggest and the most spacious from all standard mattress sizes available with actual dimensions 76 inches (193 centimeters) wide and 80 inches (203.2 cm) long. It is 16” wider in comparison with a queen size mattress. Total mattress area is 6080 in² or 39,218 cm² and in total it is about 27% bigger than queen size. For small rooms it is not a good choice, but bigger master bedroom will be perfect for accommodating king size with its dimensions. It will take about 22% of a total 14’ x 14’ bedroom space leaving enough room for longer nightstands and even bigger bedroom furniture. King size more than twice bigger in comparison with a twin mattress size and two people will have their own 3040 in² or 1.97 m² with 38 inches in width space and even huge and taller than average people will have enough room for comfortable rest. It is the best mattress option available for couples. It is heavier than any other mattress and will range in thickness from 5” to 21” depending on a type and brand. With different base profile and optional a couple of inches pillow top total height might go up to 28 – 30 inches or 0.7 – 0.8 meters. Some types of king sizes mattresses might weight 160 – 190 pounds or 73 – 86 kilograms what makes it hard to move or transport. There are have to be at least 450 coils, but quality mattresses often range 600 – 700 with a 12 – 16 gauges spring wires making the surface firm or softer. Memory foam king mattress have a few layers of foam different density and thickness. Usually brand name products will have at least one 2” – 5” thick high density from 5 to 7 lb/cu ft layer what will make the surface super comfortable. King size mattress with actual dimensions 76” x 80” in US and Canada will be closest in size to super king mattress in UK with actual measurements 72” in width and 78” in length or 180 cm x 200 cm. with a total space area of 5,516 in² or 3.6 m². 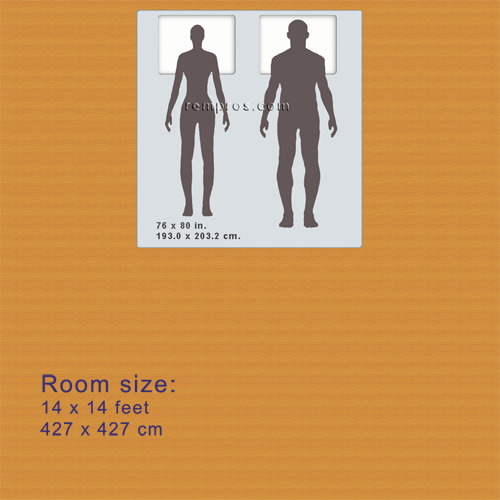 Dimensions of king size mattress were proportionally resized according to average men heights - 5 feet 10 inches (1.778 meter) and average women heights 5’ 4 ½" (1.638 meter). Master bedroom size - 14 x 14 feet (427 x 427 centimeters).